Smart Farm by Mr Stacky Change Your Lifestyle Grow Healthy, Nutrient-Rich Food Easier, Faster, and More Convenient Then Ever Before Set Timer To Water Automatic Daily (Simple) Go On Vacation And Come Back To A Thriving Garden. 16 Gallon Tank Lasts 2-3 Weeks. 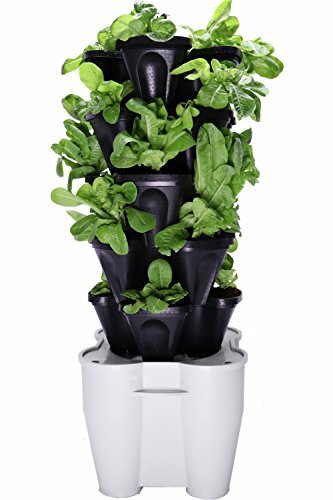 (Convenience) Recirculates Water Back Into The Tank Saving 85% Water Compared To Traditional Gardening (Eco Friendly) Operate a Large 20 Plant Veggie Garden in a 18.5" x 18.5" Food Print (Space Saving) Pots Rotate Around The Center Pipe. Makes it Easy To Rotate Into The Sun If Garden Is In A Corner. (Smart) Take Control Of Where Your Food Comes From and How It's Grown Hydroponics: Hydroponics sounds a lot more complicated then it actually is. Anyone including "brown thumbs" can do it. Hydroponics just means we are add plant food to the water and we use a different growing medium to replace soil. This allows us to know exactly what we are feeding our plants and providing only what our plant needs. By growing hydroponically we can grow larger veggies faster in a smaller footprint and conserve water all at the same time. How awesome is that? Yes you can grow in soil too but hydroponics is recommended. We promise it's not hard and we are always here to help customers. You can even grow rooted plants such as Beets in the Smart Farm. What Can I Grow Hydroponically? : Here is a list below to give you ideas: Cucumbers Bell Peppers Butternut Squash Beets Green Beans Snap Peas Tomatoes Watermelon Zucchini Herbs Strawberries All Kinds Of Leafy Greens And On and On and On How Do I Start? : Start By Filling Up The 16 Gallon Tank With Water Add 2 Tsp of Plant Food (Included) Per Gallon of Water Fill Each Pot With 75 % Coco Peat (Included) and 25% Perlite (Not Included) Plant Each Pot (Start With Seeds or Plants) Set Timer and Plug In Pump (Grow Guide Included) We Believe That Growing Food At Home Not Only Provides A Healthier Life But A Happier One! Change Your Lifestyle: Grow Healthy, Nutrient-Rich Food Easier, Faster, And More Convenient Than Ever Before All Year-Round, With or Without Soil. - We Believe That Growing Food At Home Not Only Provides A Healthier Life But A Happier One!